The Jewish-Latino Outreach program consists of two semesters of weekly sessions from September through May, which explore discussions of Jewish and Latino identity, history and values, and intercultural competency. See below to learn more about the program and program sessions. Read about the Outreach Projects here. In this introductory session, the Jewish-Latino Outreach participants met each other and program leaders for the first time at the Museum of Tolerance. They participated in icebreaker activities, program orientation, toured the Museum, and engaged in workshops on identity awareness. This first Tuesday afternoon program session focused on reasons for Jewish-Latino outreach, and identified key goals and objectives of such an endeavor. The program participants heard three presentations concerning this topic, moderated by Liebe Geft, Director of the Museum of Tolerance, and explored the Museum’s Legacy of Light exhibit, which presents the history of Jewish social activism and communal outreach and support in the United States over the last 100 years. This session explored the complex diversity that exists within Jewish communities in the United States and around the world. Loolwa Khazoom, a renowned presenter on this topic, provided an interactive overview of the 5,000 years of Jewish history. Rabbi Aron Hier, Director of Campus Outreach for the Simon Wiesenthal Center, presented a workshop that discussed Jewish/Israeli history and identity, approaches to the Israeli-Palestinian conflict, and identified central themes of Jewish commonality and vision. The student fellows and college interns participated in a dynamic and highly interactive session focused on emotional intelligence and diversity, facilitated by the Emotional Intelligence and Diversity Institute (www.eidi-results.org). The participants worked collectively to identify communication skills necessary for overcoming cultural and social divides, and considered the positive and negative aspects of their own communication styles. This session featured a live theatrical performance by the renowned L.A. based theatre group, Encompass, entitled, “Wheels.” This performance explored xenophobia in America, and presented challenging questions for the program participants about privilege and responsibility as it relates to citizenship. Program participants explored their own personal prejudices during discussion, and considered new approaches to overcoming social and cultural differences in preparation for Jewish-Latino outreach initiatives. Presenters: Jorge Cherbosque, PhD; Anita Rowe PhD; Lee Gardenswartz Ph D.
In the second session facilitated by the Emotional Intelligence and Diversity Institute (www.eidi-results.org), the program participants explored concepts related to Self-Governance. The group identified and discussed their ‘hot buttons’, and considered the types of assumptions they commonly make while interacting with others. The session ended with an exercise focusing on real world situations in which there is a need for increased self-governance and self-awareness. SESSION 7: WHO ARE LATINOS? In this session, students heard directly about Latino experiences and culture. Mr. Alvaro Huerta, visiting Lecturer at UCLA’s Chicano Studies Research Center, provided the group with a fascinating, challenging, and occasionally controversial overview of the common, complex Latino experience in America today. Ms. Cyndi Bendezu, a UCLA honors graduate, originally from Lima, Peru, shared the story of her remarkable and difficult journey through the American educational system. Participants also heard from a representative from IDEPSCA, Instituto de Educaion Popular del Sur de California, as well as a Car “Washero”. This session initiated a six-week collaboration between program participants and twenty-five Latino students from Roosevelt High School in Boyle Heights. This first collaborative session focused on storytelling, family history, and sharing of life experiences, with the aim of beginning to understand more of the similarities and differences between the groups. Following a tour of Museum of Tolerance permanent exhibit, ‘Finding Our Families Finding Ourselves’, the program participants and Roosevelt High School students worked in small groups, under the guidance of the college interns, to identify and storyboard key points in their lives. Alma Fullerton, winner of the 2009 Once Upon a World Children’s Book Award, helped facilitate a short Spanish and English language reading from her book Libertad. SESSION 9: VIVA LA CAUSA! In this session, the program participants and students from Roosevelt High School viewed the documentary, Viva La Causa, which focuses on one of the seminal events in the march for human rights - the grape strike and boycott led by César Chávez and Dolores Huerta in the 1960s. Ms. Maria Elena Chávez, daughter of Dolores Huerta and niece of Cesar Chávez, led a spirited discussion on the themes of the film with the group. Rabbi Adlerstein delivered a presentation on the Jewish way of food and eating. Program participants and students discussed the Museum’s Legacy of Light exhibit, which focuses on the tradition of Jewish engagement and activism in the search for human rights and social justice in the United States. In this session, the program participants traveled to Roosevelt High School in Boyle Heights. Professor Steven Windmueller of Hebrew Union College, and Jaime Regalado, Executive Director of the “Pat” Brown Institute of Public Affairs at Cal State L.A, delivered a joint presentation on contemporary Jewish-Latino relations in Los Angeles. 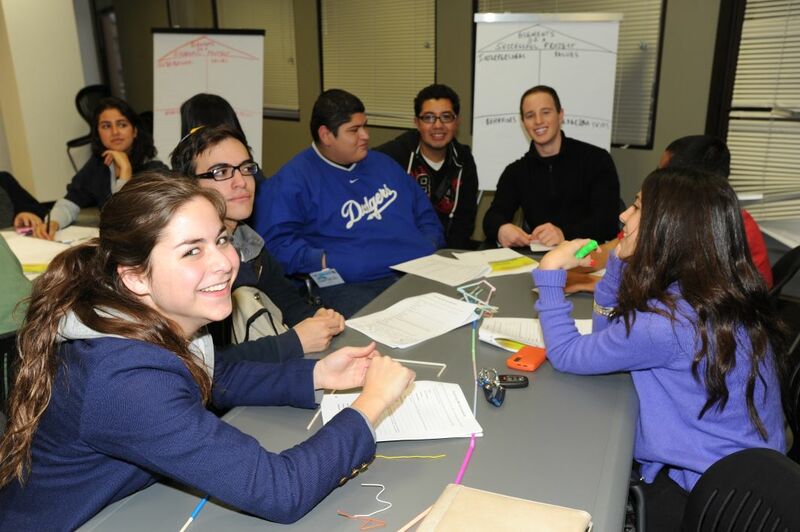 Program participants and students generated their own ideas to encourage and enhance Jewish-Latino relations in Los Angeles. In the third workshop session facilitated by the Emotional Intelligence and Diversity Institute (www.eidi-results.org), program participants and students from Roosevelt High School focused on understanding cultural differences as related to Intercultural Literacy. Participants and students collectively explored their cultural similarities and differences through activities on cultural proverbs and cultural values. Together they worked toward identifying when culture presents challenges and overcoming such challenges. In this session, program participants and students from Roosevelt High School explored the many ways in which the local and international media often seek to manipulate and dictate the news. Ms. Yael Swerdlow, photojournalist and former Director of Media Relations at the Israeli Consulate, and Ms. Mireya Magaña, current Press Attaché at the Mexican Consulate in Los Angeles, presented a “crash course” in media bias as relative to Jewish and Latino cultures. Program participants and students worked in small groups to discuss their own ideas about how they would like to see their respective communities represented in the local, national, and international media. The program participants and students from Roosevelt High School met for last time in the penultimate session of the first semester. In the final workshop session facilitated by the Emotional Intelligence and Diversity Institute (www.eidi-results.org), participants and students explored Social Architecting, and gained understanding of the skills and approaches necessary for ‘building bridges’ and enriching social relationships. Participants and students showcased various presentations of their six-week collaboration. In the final session of the first semester, the program participants reflected on the previous sessions, and began work in creating intercultural outreach projects that enhance and encourage Jewish-Latino collaboration in the community. Read about each outreach project here.